Nissan's Mark Perry conducted a webchat today answering questions about the Nissan LEAF, electric car fast charging standards, fast charging networks, Nissans low price CHADEMO station, and more. Today, in a bit of online social media outreach, Nissan North America's Director of Product Planning, Mark Perry, held a webchat to discuss the Nissan LEAF. Nissan is making excellent use of online social networking to reach out to prospective Nissan LEAF owners, to answer questions, and even conduct contests, this time it is a text based webchat with Mark Perry directly fielding questions from the audience via Nissan's nissanleafdrivers.com blog. Charging, especially Fast Charging, questions were asked the most in the chat. "What is the status on the affordable Nissan-branded DC Quick Charge stations?" The Nissan LEAF can be bought with a CHADEMO 1 compatible quick charge port that can recharge the car to 80% capacity in under 30 minutes. Studies have shown the availability of quick charge stations improves electric car utilization, and quick charging appears to be Nissan's solution for the "range anxiety" bugaboo. Last November, Nissan and Sumitomo announced development of a lower cost, under $10,000, CHADEMO quick charge station that can additionally be used on a 240 volt single phase AC power source. Existing CHADEMO stations are 3x more expensive than this, and require an expensive 480 volt three phase AC power source. While there are deployments of CHADEMO quick charging station networks underway in California (350Green and eVgo) and Chicago (350Green), networks that are lower cost to build obviously can be built out more quickly. Mark Perry: "DC fast charging is coming very soon. We are finalizing specifications and hope to start sales this Spring." When the Nissan/Sumitomo station was announced, the companies said an online ordering system to take pre-orders would launch in Jan 2012, and that Aerovironment would manage the installation and deployment process. Aerovironment has a couple decades of experience developing electric vehicles, and especially charging systems for electric vehicles, and has a trained staff of charging station installers available nationwide. The Nissan/Sumitomo quick charge station is expected to come in two models, one for indoor use, the other for outdoors. Due to its $9,999 price tag this is unlikely to be targeted to regular consumers, but instead to fleet purchasers, or for companies like 350Green or eVgo that are building charging station networks. "If we want to preserve battery performance is quick charge safe?" Many observers are concerned that quick charging will harm the battery pack, while both Nissan and Mitsubishi claim it is safe. Another questioner asked "The user manual recommends quick charging only once a day. Do the following cases affect the battery health in different ways? A) Quick charging the LEAF four times in one day, followed by three days without quick charging. 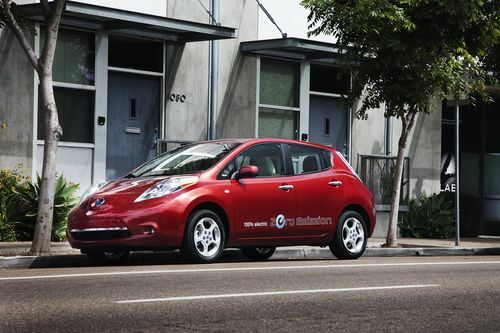 B) Quick charging the LEAF once a day in four days?" This reminds me of a high school friend who wanted to give up Lent for Lent, reasoning that Lent was the time you give up things that are good for you, that Lent is supposedly good for you, and therefore... uh..
Mark Perry: "Absolutely! The LEAF is capable of quick charging multiple times per day. Our battery management systems always protects the battery from risk. Charging rates will slow down if for some reason temperatures get out of the 'normal' range." Mark Perry: "We updated the owners manual. Multiple quick charges are ok. The BMS protects the battery in all cases. If temperatures get outside normal range the charging rates simply slow down." What he's saying is the potential for harm is if the battery pack temperature rises too high during fast charge. It's not the act of fast charging that can cause damage, but the temperature increases. "What is the status of the SAE DC fast charging standard? Will Nissan continue with the CHADEMO connector?" See Electric car fast charging controversy clouded by California's new plans for a full background explanation. Mark Perry: "We fully support CHADEMO and have no plans to change no matter what SAE decides. We have the only cars capable of quick charging (over 11,500). No reason to change!" First, the Nissan LEAF is not the only CHADEMO compatible electric car. The Mitsubishi i-MiEV is also CHADEMO compatible, but that car has not seen much sales in the U.S.
Second, what we have brewing is a sort of Beta-versus-VHS situation. On the one hand is the CHADEMO-compatible cars (LEAF and i-MiEV) and the SAE DC Fast Charge compatible cars, of which there are zero models available. By the time the SAE DC Fast Charge standard is finished, designed and tested by manufacturers, and available in future electric car models, 4 or 5 or 6 years will have passed. Within that time Nissan and Mitsubishi will have sold lots and lots of CHADEMO compatible electric cars, and CHADEMO charging station networks will have been built in many places. Nissan's attitude is they're charging full steam ahead establishing CHADEMO as a de-facto standard. But it will mean that in a few years time there will be three fast charging standards in common use, the CHADEMO and Tesla standards being deployed now, and the SAE DC Fast Charge standard to be available some time in the future. "Will the 2013 LEAF's have a 6.6 kilowatt charger?" Current LEAF's have a 3.3 kilowatt charger and the relatively long recharge time (at J1772 stations) of the LEAF is due to this factoid. Ford and Coda both are offering a 6.6 kilowatt charger to claim a faster recharge rate than the LEAF. Mark Perry: "Yes, a 6.6 kilowatt charger will be an option." Answering another question he said Nissan will not offer a retro-fit option to put a 6.6 kilowatt charger into either the 2011 or 2012 LEAF's. "How many miles could I get from a half hour charge on 120 volts if I were in a pinch?" The same questioner later asked "Are you required to buy the charging station when you purchase the LEAF?" explaining that he lives in a small town and thinks he would be fine with the 120 volt charger. Mark Perry: "120 volt charging gives you 1.4 kilowatts per hour. In an hour of charging, about 5 miles, in 30 minutes, about 3 miles." and "About 15% of our LEAF owners are fine using only Level 1 (120 volt) charging. Really depends on your commute patterns. Senator Alexandar only uses Level 1 for his LEAF in DC." The Nissan LEAF has a 24 kilowatt-hour battery pack meaning the 3.3 kilowatt charger will take 7-8 hours for a complete recharge, and the 120 volt 1.4 kilowatt charger will require close to 20 hours for a full recharge. As the questioner explained, not everyone lives in an area that requires long driving distances. If you drive 20 miles a day the 120 volt charger would recharge that amount of driving range in about 4 hours. "Smyrna LEAF. When will cars roll off the line?" Nissan is building a factory in Smyrna TN (partly with a low interest Dept of Energy loan) where Nissan is promising to build battery packs and up to 150,000 Leaf's per year. At the NY Auto Show last week, Carlos Ghosn described this strategy as one of "local production", where production of a given Nissan LEAF will be done on the same continent where it is sold. European LEAF's will be built at a factory in England, while North American LEAF's will be built in Smyrna. Mark Perry: "We expect start of production in December 2012." That's for the Nissan LEAF, additionally the Smyrna plant is to handle battery pack production. He explained that battery pack production will start in the Fall 2012, a little bit before LEAF production in Smyrna begins. "Rumor has it Nissan is running a couple LEAF's continuously on a track in Arizona, stopping only to quick charge and relieve drivers." Mark Perry: "no rumor. We have a test facility where we do long term testing of lots of vehicles. The track is a banked oval, 5.5 miles long, and gives the test drivers chances to rack up lots of miles in pretty tough conditions." This is what we want our automakers to say, that they're testing the vehicles every which way they can so that the cars don't blow up in our hands. "How is range affected by the use of climate control. Seems to get better range in the summer than winter." Mark Perry: "If you use the heater on max, that pulls about 4.5 kilowatts. If just AC, power used is about 1.5 kilowatts." The 24 kilowatt-hour battery pack gives a budget of energy the driver has available to use in whichever way he or she could want. Electricity used to run the heater cannot be used to drive the car, and that heater draws a lot of power. Back in January we noted while discussing Nissan LEAF winter driving tips, that the seat and steering wheel heaters use less power than the cabin heater, and that using these for heat would give better driving range. You can interact with the Nissan Leaf social media team through the @NissanLEAFhelp or @NissanLEAF twitter accounts. Great article. This is very refreshing news regarding the LEAF's ability to absorb fast charging, I'm glad I opted for the fast charge port.. The 201 model does not have the heated seats/steering wheel, so range in winter will continue to be a consideration, Thankfuly only about 10 weeks a year are cold enough in Tennessee to impact my range. Fast charging is the reason I decided to go ahead with a Leaf instead of a Volt...now if they'd only get the network deployed!